Vancouver is my ABSOLUTE favourite city. If you’re coming to Canada, you must put Vancouver onto your itinerary now. Vancouver is a bustling city with a relaxed and friendly vibe, hosting Canadas most ethnically diverse population. Despite being in a downtown metropolis, you feel so close to nature with the mountains and sea surrounding the city, offering many outdoor pursuits. The city is full of art galleries, museums and music scenes – something for everyone. Stanley Park is a must see in Vancouver. The best way to explore Vancouver is by hiring a bike and spending a day riding around the massive national park. Some of the best posts include Prospect Point, Beaver Lake and Second Beach. The trip to Grouse Mountain is amazing in itself. Catch the ferry across the harbour and ride the bus up to Grouse Mountain where you can ski/snowboard, zip line, watch Grizzly bears frolic or you can simply just enjoy the view. If you’re up for it, take the Grouse Grind, a 1-hour hike up Grouse, short but very steep. Nestled on Vancouver’s North Shore and not to be missed. Lynn Canyon has a FREE suspension bridge, cliff jumping spots in the canyon and hikes to waterfalls. I highly recommend Lynn Canyon due to its amazing scenery, fun variety of activities and the fact that it is free. Capilano Bridge is a 140-metre long suspension bridge that leads to a treetop adventure in the rainforest, located on Vancouver’s North Shore. The suspension bridge offers amazing views and is a backpackers favourite, but I prefer Lynn Canyon as it is free and less crowded. Admission price is $47 for adults, so if you are backpacking Vancouver and looking to save, head to Lynn Canyon instead. A world-renowned leader in Marine science with over 50,000 animals and over 30 unique exhibits. You also get the chance to get up close and personal with the animals. The cost is $38 for an adult. This would be a great rainy day activity, but if you are backpacking Vancouver, it may cost more than your budget allows. Enjoy views of cosmopolitan Vancouver, historic Gas town and bustling Coal Harbour. The cost is $17.50 per adult and in my opinion is worth it. Try visiting at sunrise or sunset. A tourist hotspot, shopping district, foodies dream and entertainment centre of Vancouver. Any trip to Vancouver should involve a trip to Granville Island and markets. You could spend a full day walking around Downtown Vancouver without getting bored, it is such a beautiful and vibrant city with so much to see. Yale town is a beautiful part of Vancouver. The area is more residential and quieter than Downtown. I recommend walking to Yaletown and catching the Aquabus across the water to Granville Island. This is one of the best activities for backpackers in Vancouver because it is totally free, and the scenery is amazing. I love spending my days in Vancouver hiking and exploring all that the region has to offer. The is a great range of day hikes on offer and even some multi-day treks if you’re up for it. Some hikes in Vancouver and the surrounding region include the Grouse Grind, Mount Seymour, Dog Mountain, Saint Mark’s Summit and the Lions. Vancouver Island is a must-see destination in Canada. From Vancouver, you can take a ferry over to Vancouver Island where you will find the capital of British Colombia, Victoria, Nanaimo and Tofino. Vancouver Island is popular for hiking, surfing, wildlife, fishing and the famous Butchart Gardens. Check out this Nanaimo to Tofino road trip guide. 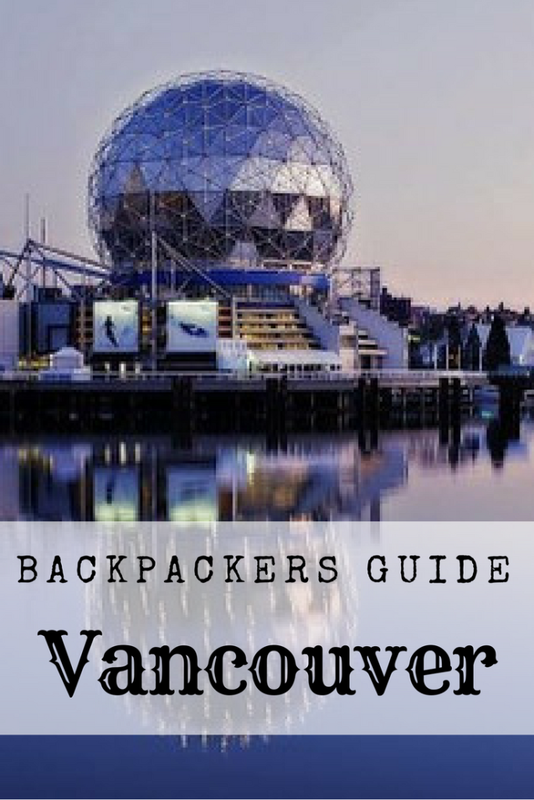 This may not be the most budget-friendly activity for someone backpacking Vancouver, but it will be a once in a lifetime experience that you will never forget. The great thing is that you will get a taste of Vancouver from above, the coastline and the mountains – a little bit of everything. Robson Street, Pacific Centre on Granville Street and Granville Markets. Summer: June – August, however, it is warm up until late September. I recommend visiting between June- September. I recommend spending 4 -6 days in Vancouver, before heading out to the Rocky Mountains. If you arrive at Vancouver Airport, there are a number of ways to get downtown. Sky Train: Takes you directly from the airport to downtown for $5-7. Arrange a transfer: Aeroshuttle provides a transfer service for $14.00 one-way (not including a tip, see my guide to tipping in Canada). If you don’t have lots of luggage I recommend taking the train. Otherwise, arrange a transfer and save money. Bus: you can simply walk across the street to the bus stop and catch one of the buses leaving frequently. The bus costs approximately $1.50 and circles the city. Ask the driver to let you know when your stop is. Taxi: Taxis wait out the front of the bus station and cost around $15 to get downtown. When in Vancouver, I find that most places are within walking distance. However, there are public bus services to help get around. Samesun Hostel: Located on Granville Street is my personal favourite. Hosteling International: There are three HI Hostels in Vancouver. HI Vancouver Downtown is a clean and quiet hostel located close to Granville Island. HI Central is on Granville Street in a great location amongst the pubs and clubs and HI Jericho Beach, which I have personally never stayed at. Search for cheap accommodation options here. $ – Expect to pay around $40 CAD for a bed in a hostel dorm room. $$ – Expect to pay around $150 + CAD for mid-range hotel room. $$$ – Expect to pay $500 CAD for a luxury hotel room. Car hire starts from $25CAD per day in Vancouver. This excludes insurance. You could survive on $15 per day for food if you book a backpackers in Vancouver that includes breakfast and cook your own meals. A meal in a restaurant will generally cost $10+ – more for drinks. Tipping is customary in Whistler. See my guide to tipping in Canada. The currency used in Vancouver is CAD – Canadian Dollars. Some businesses also accept USD. I recommend getting travel insurance before your trip to Vancouver. I recommend World Nomads. If you are still unsure if you should buy travel insurance or not, read this. It is recommended to exercise all usual safety precautions in Vancouver. Although it is a relatively safe city, you should still avoid flashing valuables and drawing attention to yourself. Also, avoid walking down unknown streets late at night. Before setting off on a hiking or outdoor adventure in Vancouver, be sure to check the weather forecast and be aware of wildlife in the area. Bears are known to the area and it is recommended to carry bear spray on certain hikes. Always tell someone where you are going and carry a means of communication. Check the Travel Doctor website to find out if you need any vaccinations for your backpacking trip to Vancouver. Tipping is a customary part of Canadian culture. See my guide to tipping in Canada. Whistler is just a short, 2-hour bus ride from Vancouver. If you have time, it is worth the visit. See my Backpackers Guide to Whistler. Summer is the best time to visit Vancouver. Even in summer, I recommend packing a light jacket. Vancouver is a very walkable city. Wear your walking shoes and explore by foot as much as you can. Leave enough time on your itinerary to be able to experience all Vancouver has to offer. 4 – 6 days is recommended. Keep an eye out for free walking tours, trivia nights and so on. There are plenty in Vancouver and are perfect for backpackers. Vancouver is a great destination for solo travellers. If it is your first solo trip, check out my advice. 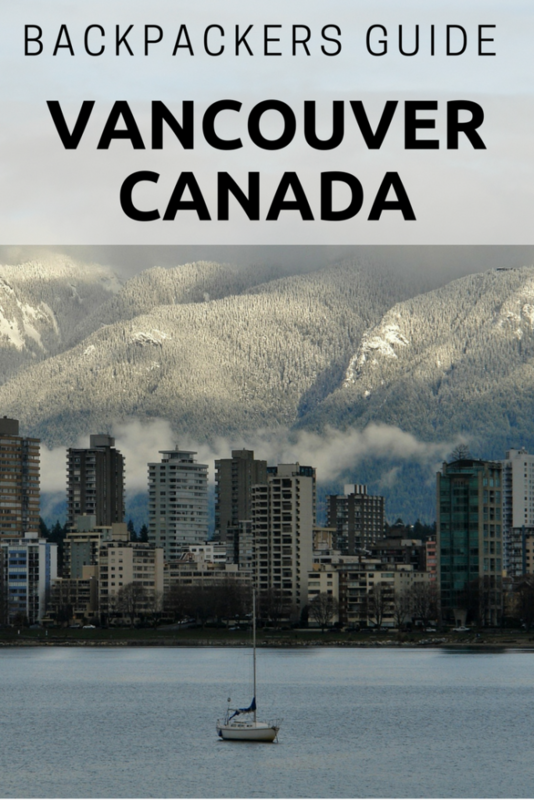 Download my Overseas Travel checklist so you don’t forget anything on your trip to Vancouver. See more from Canada here. Disclosure: This post on things to do in Vancouver contains affiliate links.